My son commissioned me to make a special quilt for his godchild, Ivy Rain. It was for her third birthday. Her family raises goats and uses them as pack animals in the mountains of Wyoming. 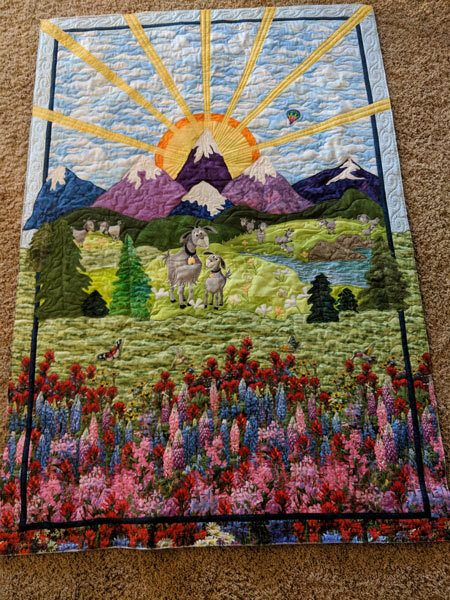 My son said the quilt had to have goats and mountains and birds and flowers, etc. So I set about making a landscape quilt with no pattern. It was fun and challenging and turned out really well! Ivy is fortunate to have adventurous parents, a loving godfather and a talented godgrandmother. Way to go Phyllis! Beautiful Colorful. Whimsical design is so fun and unique.